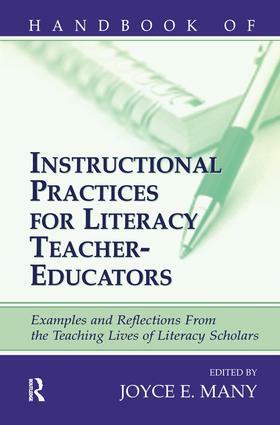 This volume offers a unique glimpse into the teaching approaches and thinking of a wide range of well-known literacy researchers, and the lessons they have learned from their own teaching lives. The contributors teach in a variety of universities, programs, and settings. Each shares an approach he or she has used in a course, and introduces the syllabus for this course through personal reflections that give the reader a sense of the theories, prior experiences, and influential authors that have shaped their own thoughts and approaches. In addition to describing the nature of their students and the program in which the course is taught, many authors also share key issues with which they have grappled over the years while teaching their course; others discuss considerations that were relevant during the preparation of this particular syllabus or describe how it evolved in light of student input. The book is organized by areas within literacy education: reading; English/language arts; literature; emergent literacy; content-area literacy; literacy assessment and instruction; literacy and technology; and inquiries into literacy, theory, and classroom practice. It is accompanied by an interactive Web site: http://msit.gsu.edu/handbook. This online resource provides additional information about the authors' courses including complete syllabi, recommended readings, grading rubrics, and sample assignments. Readers are invited to respond and contribute their own syllabi and teaching experiences to the discourse generated by the volume. "Provides a glimpse into the teaching approaches and thinking of some well-known literacy teacher educators….The choice of contributors is impressive….I need this book for my personal library." "A valuable resource tool for both the novice and experienced literacy educator….When the contributors talk about the way they organize and teach their classes, develop goals for their students, and describe the problems they struggle with, they provide a more complete picture of the professor at work. Teaching excellence doesn't happen overnight. The accounts describe the process by which professors grow and learn through continuous evaluation of their instruction." "All literacy scholars will want to purchase this book. It will serve as a guide for new instructors, a tool for self-reflection and revision for established instructors, and an excellent resource book for doctoral literacy courses." Contents: Preface. Part I: Reading. D. Wiseman, Two Views Presentations: Demonstrating the Differences Between Theoretical Orientations in Reading Instruction. S. Pasquarelli, R. McCormack, Matching Standards With Substance: Preparing Preservice Teachers to Teach Literacy. S. Oran, K.B. DeMarrais, J. Lewis, Social Foundations as a Foundation for Literacy Instruction: An Effort in Collaboration. V. Purcell-Gates, Comprehension of Text: The Reader/Text Relationship. T.E. Raphael, The Book Club Workshop: Learning About Literacy and Culture Through Autobiography. Part II: English/Language-Arts. J. West, Teaching of Communication Arts. D. Cooner, D. Wiseman, Writing Buddies: Linking School and University Teachers in Language Arts Methodology Instruction. J. Allen, Whole Language Teaching in Elementary and Middle School. N. Farnan, Teaching and Learning in the English Language Arts. P. Smagorinsky, Preservice Secondary Language Arts Teaching Methods. P. Albers, Oral and Written Communication. D. Schaafsma, Teaching of Writing as Story. Part III: Literature and the Teaching of Literature. K. Short, C. Anderson, The Art of the Picture Book. L. Galda, Children's Literature in the Curriculum. P. Enciso, Mediating Multicultural Children's Literature. V. Harris, Teaching Multicultural Children's Literature: Struggling With Aesthetic, Educational, Political, and Cultural Change. B. Probst, Adolescent Literature and the Teaching of Literature. Part IV: Emergent Literacy. L.M. Morrow, Literacy Development in the Early Years. M. Matthews, Research and Theory for Constructivist Leadership in Early Childhood. D. Yaden, A. Chavez, C. Cubillas, Encounters With Print: Beginnings of Reading and Writing. Part V: Content Area Literacy. C. Lloyd, Reading for Secondary Teachers. V. Ridgeway, Secondary Content Area Reading. T. Bean, Content Area Literacy. Part VI: Literacy Assessment and Instruction. P. Freppon, Assessment and Instruction in Literacy Courses and a Tutoring Practicum. S. Stahl, Reading Diagnosis and Remediation. R. Tierney With L. Lawson, E. Marshall, Learner Centered Assessments for Preservice Classroom Teachers. Part VII: Language and Literacy in a Diverse Society. J. Hoffman, R. Salas, B. Patterson, Community Literacy. J. Marshall, Language and Learning. M. Smith, Creating a Common Project in the Study of Diversity. R. Hough, Methods and Materials for the Bilingual/ESL Teacher. Part VIII: Literacy and Technology. L. Labbo, D. Reinking, Computer-Based Instruction in Reading Education. D. Reinking, Topics in Computer-Based Reading and Writing. Part IX: Inquiries Into Literacy, Theory, and Classroom Practice. L. Patterson, Action Research in Educational Settings. C. Leland, J. Harste, Creating Curricular Invitations: Reading, Writing, and Inquiry. J. Hoffman, The History of Reading Instruction. R.E. Ferdig, P.D. Pearson, Negotiating a Syllabus for a Doctoral Course in the Psychology and Pedagogy of Literacy. J.E. Many, Trends and Issues in Literacy Education.